If you have been arrested for a homicide charge of murder, you need an experienced criminal defense lawyer with murder trial experience. From the outset of this serious situation, you should have legal representation provided by a Murder Defense and Homicide attorney who understands how to present a defense that can lead to a positive outcome. Even wrongful accusations or accidental deaths necessitate the skill of an experienced defense lawyer. You cannot afford to wait when murder charges are pending or when you’re named as a suspect. It does not matter if it was an accidental shooting or a bar fight that resulted in death, when you’re under suspicion of murder, you need help as quickly as possible. Seeking counsel from an attorney is not an admission of guilt. How Is Murder Different from Manslaughter? Manslaughter is killing without malicious intent. This means that, in order to be convicted of murder/homicide, you must have killed someone intentionally with forethought ahead of the event. In North Carolina, the law defines first-degree murder and second-degree murder by the intent of the person who allegedly committed the crime. First degree murder – is the willful, deliberate and premeditated killing of another person or group of people. Murder charges in the First Degree require malice aforethought and premeditation. North Carolina statute, N.C.G.S. § 14-17, provides details for how the state determines a charge of First Degree murder. Consider the example of a husband who comes home to find his wife in bed with another person. A few days later, the husband waits outside the other persons home. When they emerge from their home, the husband shoots and kills them. What Constitutes First Degree Murder? Intent – to commit on purpose first degree murderers must have the specific intent to end a human life. This intent does not necessarily have to correspond to the actual victim either. If the killer intends to commit a murder but kills the wrong person or a random person, the charge would be first degree murder. A killing through action showing a depraved indifference to human life can qualify as murder in the first degree. Deliberate – long and careful consideration or discussion about committing the crime of murder. Time of consideration does not have to constitute days or weeks. Only enough time has to pass for the idea to form of conscious intent to kill and then act on it after enough time for a reasonable person to second guess the decision typically suffices to be charged as First Degree. Because the subtleties of murder and manslaughter, the decision to commit murder can happen very quickly, therefore deliberation and premeditation must occur before, and not at the same time as the act of killing. Premeditation – the action of planning something beforehand. Malice – Malice generally includes an evil disposition or purpose and an indifference to human life. Felony Murder – a statute that convert a charge to First Degree instantly if the killing satisfies particular felony requirements. Consider the example of a robbery. As the perpetrator of the robbery flees the scene, the store owner shoots toward the suspect, but accidentally hits and kills an innocent bystander. Due to the felony murder rule, the person committing the crime, NOT the store owner, would be charged with first-degree murder even though the robber never actually did the killing. The bystander would never been in harm’s way if not for the actions of the robber. Second Degree Murder is the opportunity for the State to attribute a charge for a death to a guilty party. Basically this acts as net for all other acts of intentional murder that do not fall under the First Degree. Typically, if the State prosecutor cannot prove one element of First Degree murder, they will likely seek a conviction for Second Degree. Second-degree murder may best be viewed as the middle ground between first degree murder and voluntary manslaughter as the criminal act for both crimes is the same, which is the death of another person. The separating factor is that of the killers mental state at the time of the homicide. In North Carolina a person could also be charged with second-degree murder if the victim’s death was caused by the unlawful distribution of opium or any synthetic or natural salt, compound, derivative or preparation of opium, cocaine or methamphetamine, and its ingestion caused the death. North Carolina law recognizes the rights of unborn persons in cases that may result in fetal death. Basically, this law recognizes the unborn child of a pregnant mother as a second victim to any criminal offense which results in serious injury or death to the unborn child. In addition, the law will issue a murder charge where a child is born alive but dies as a result of injuries inflicted prior to the child being born alive. Ignorance of the pregnancy does not absolve fault from the person charged. First degree murder is a capital offense in North Carolina. Any person who commits such murder shall be punished with death or imprisonment in the State’s prison for life without parole as the court shall determine pursuant to G.S. 15A-2000, except that any such person who was under 18 years of age at the time of the murder shall be punished in accordance with Part 2A of Article 81B of Chapter 15A of the General Statutes. An act of domestic violence as defined in G.S. 50B-1(a). A violation of a domestic violence protective order under G.S. 50B-4.1(a), (f), (g), or (g1) or G.S. 14-269.8 when the same victim is the subject of the domestic violence protective order. Communicating a threat under G.S. 14-277.1. Stalking as defined in G.S. 14-277.3A. Cyberstalking as defined in G.S. 14-196.3. Domestic criminal trespass as defined in G.S. 14-134.3. Any person who commits second degree murder shall be punished as a Class B1 felon, except that a person who commits second degree murder shall be punished as a Class B2 felon in situations caused by the ingestion of such substance caused the death of the user. This related to the Drug distribution statute mentioned above. the malice necessary to prove second degree murder is based on an inherently dangerous act or omission, done in such a reckless and wanton manner as to manifest a mind utterly without regard for human life and social duty and deliberately bent on mischief. A conviction for attempted first-degree murder is punishable as a Class B felony, the same punishment level for second degree murder. Murder cases are rarely straightforward, and the circumstances surrounding the events of the crime have the potential to sway a jury. Your defense lawyer should be capable of crafting a case that evaluates these circumstances to your advantage. Were you acting in self defense? Maybe you have been misidentified by eye witnesses. Regardless of the reason of a charge, facing an indictment of murder is a life altering event. Speak only to your criminal lawyer even if you have an alibi at the time of the homicide. DO NOT talk to anyone else other than your attorney about your case or you may further risk incrimination. Remember that your Raleigh criminal defense lawyer was hired to help you. The prosecution are looking for a conviction and will use any available resources to help their case. At this time, even close friends shouldn’t be given information regarding your case. Often friends may not even be on your side if implicating you will help them escape imprisonment. The defense strategy of your criminal defense attorney will depend on the circumstances involving your individual case. A mistake in identity could become the factor that determines your innocence or the death of the victim may not have been caused by the defendant at all and your attorney will present the facts. At Kirk, Kirk, Howell, Cutler & Thomas, LLP our team has experience needed to approach your case from all angles and determine the best defense strategy to have the charges against you dropped or significantly reduced. In first degree murder cases, as well as other homicide crimes, defendants often argue mistaken identity. This means the prosecution is pressing for a conviction against the wrong person. A defendant arguing mistaken identity can support their claim with evidence that points to the contrary of that presented by the prosecution. The most common legal justification for a killing is self-defense or the defense of others. In order for this defense to be a viable claim, the accused must meet stringent conditions set by the North Carolina Justice System. Killings committed by accident in the course of lawful activities do not constitute murder. They may be charged as a degree of manslaughter however. If the accidental homicide takes place during the commission of a crime or as a result of other criminal intentions, then the charge would be first degree or second degree murder. The insanity defense is for determining criminal liability to individuals with mental issues that caused them to commit a killing or they were unable to realize that the act is wrong. Some situations an innocent person can still be charged with a death, and need to have legal representation. Even when a mistake has been made, do not assume the problem will be rectified on its own. You still need a homicide defense lawyer if you are innocent. Our Raleigh criminal law attorneys know that you need a strong defense when you’re charged with murder. We are here to help you through the entire criminal process, even if you have not been charged yet. If you are being investigated for murder or have been arrested, the time to contact a murder defense attorney is now. Our Raleigh criminal attorneys are ready to serve you. Since 1957, the criminal law team at Kirk, Kirk, Howell, Cutler & Thomas, LLP have helped individuals accused of violent crimes. 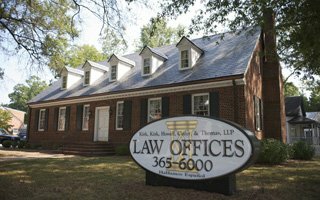 If you have been charged with murder or another homicide related charge then our Raleigh criminal lawyers are only a call away. You can schedule a consultation with a Raleigh criminal attorney by calling 919-615-2473 or completing the online contact form below.